This volume contributes to the remarkable resurgence in interest in American pragmatism and its proponents, William James, C.S. Peirce and John Dewey by focusing on the influence of British empiricism, especially the philosophies of Locke and Hume, and the sharp differences between the two traditions. It is Roth's contention that American pragmatism, sometimes called America's first "indigenous" philosophy, has something significant to say philosophically not only for America, but for the world. Here, the author claims, the lines of development and divergence between British empiricism and American pragmatism have not been sufficiently developed. Perhaps the basic philosophic move that the pragmatists make is from atomism to unity, from diversity to identity, from discontinuity to continuity. The book shows that this move added a rich dimension that has profound effects. Some of the themes explored in the volume are: causality and necessary connection; person and personal identity; and moral, social and political philosophy. A particular perspective of Roth's study is a conscious attempt to trace the lines of thought from classical empiricism to pragmatism, showing the influence of empiricism on pragmatism, as well as their profound differences. 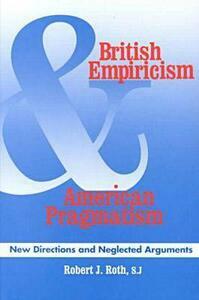 Along the way, the pragmatists' dialogue with classical idealism is also indicated.